Making the road trip down to California Ironman 70.3 down in Oceanside California. 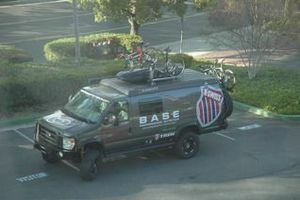 We started our trip from the Green Athlete headquarters in Danville, California. We are driving down in the Green Machine - my new Ford E350 conversion. It is a stock van that has been converted to 4x4 and with all the amenities of home. Sleeps 4, has a kitchen, fridge, microwave, great stereo, and it is all run on solar and BioDiesel. It makes a road trip very comfortable. I am actually writing this blog from the back bed as we pass Buttonwillow on the I-5. The solar is set up by Sungevity, who you will see soon at www.sungevity.com. They specialize in setting up your home with solar power which is very easy and very affordable. We have my Trek bikes on the racks and plan on riding most places when we set up camp. 1 World 2 Wheels is a program set up by Trek to build awareness of how easy it is and how good it is for the environment to just ride your bike to run short errands and to get around. We will be stopping by the K-Swiss headquarters on our way down to see the facility and say hi to the gang. They are excited to see the new Green Athlete van and to be a part of our shoe recycling drive for Soles 4 Souls program, where we collect used shoes to donate to the needy and to recycle to build tracks and playground flooring. 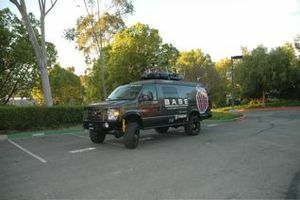 Come by and see us at the expo at the race this weekend and check out the van. Look forward to seeing you there.